“Adventure Comics” No. 306 featuring the debut of the Legion of Substitute Heroes. In “The Legion of Substitute Heroes!,” presented in “Adventure Comics” No. 306, cover date March 1963, written by Edmond Hamilton and illustrated by John Forte, a hopeful teen journeys to Earth to fulfill the dream of a lifetime – to become a member of the fabled Legion of Super-Heroes. Young Brek Bannin – calling himself Polar Boy – demonstrates his impressive power to generate massive waves of cold. The Legion is left shivering, if not exactly wowed. As excuses go, this is pretty weak. This is a team who would eventually induct a gal whose strongest when she’s sleeping and a guy known for his digestive tract. A dejected Polar Boy wanders the streets until he meets up with another recent rejectee, Night Girl. Night Girl possesses super-strength but only at night or in deep shadow and has seen fit to choose a name that broadcasts her liability to the universe. If I were Night Girl, I would have named myself All-Day Mighty Gal! When even the Omniscient Narrator thinks you are a failure …. Polar Boy has an idea – and gathers other Legion rejectees: Stone Boy, who can turn his body to stone – but remains immobile; Fire Lad, who exhales flame; and Chlorophyll Kid, who control the growth of plants. The Subs carve out a secret cave headquarters in a mountain, complete with a “Warning Wall Monitor” to notify them of planetary disasters. Their first couple of attempts to help are thwarted by the heroes they idolize who show up first and get the jobs done. 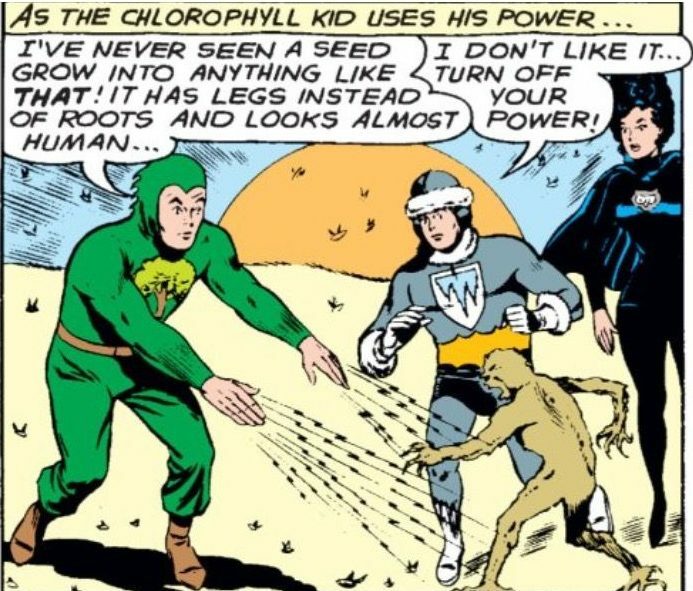 Is Chlorophyll Kid the most powerful Sub? Discuss. The Subs are ready to abandon their clubhouse forever when Chloro – Chlory? – notices some odd seeds drifting in the air and falling on the ground. He uses his super-power on one seed – and it turns into a rampaging alien invader. As twists go, this is genuinely creepy. It’s part of a diabolical plan to take over the Earth. With the Legion of Super-Heroes off battling the invaders’ robo-ships, it’s up to the Subs to save the planet. They travel to the hostile world, and after the Subs battle the plant men, Chlorophyll Kid uses his power on the missiles stuffed with seeds, making them explode with plant men. Back on Earth, the Legion of Super-Heroes get the glory for stopping the robo-ships. The Subs are happy to know they helped and stand ready to serve when needed. Night Girl should have applied for membership based on her gravity-defying beehive. The Legion of Substitute Heroes proved to be so popular with readers, they did have more adventures. They won the respect of their idols, and decades later, Polar Boy eventually won full membership. His pals were thrilled for him. 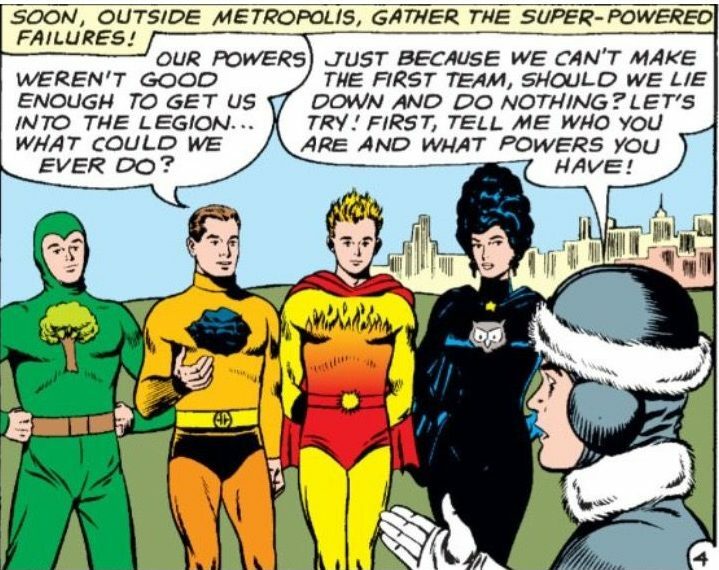 Here’s why the Legion of Substitute Heroes matters, why they are so important: Because their existence proves that no matter what your abilities, if your heart is pure and your intentions good, you too can stand with the greatest heroes. That’s a powerful and meaningful message to send to young readers. You can get this gem in the DC Comics app. 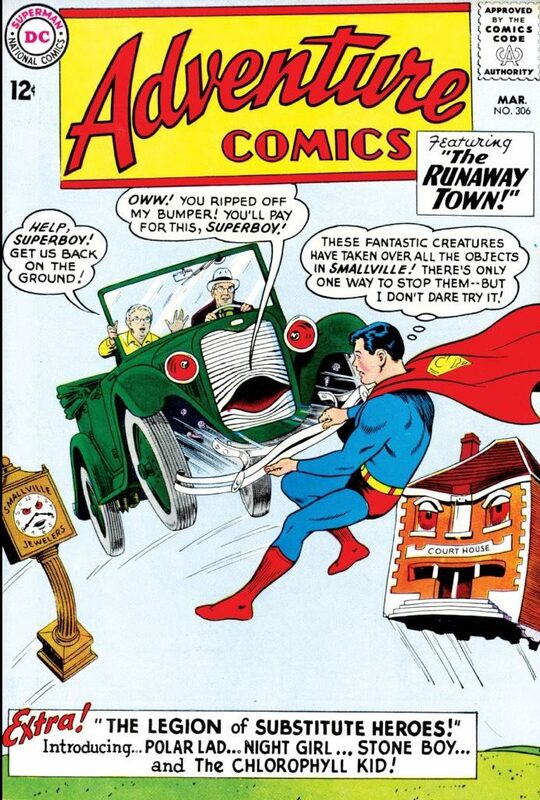 Oh, the lead story is about high school student Mister Mxyzptlk pranking Superboy and Lana Lang. It’s deranged. You have to love the Silver Age. The Legion of Substitute Heroes, oath and all. I confess that I never read the original Subs story. I’ve had more problems with their continued usage over the years. I don’t think the idea resonates too much with new readers who are much more cynical. The Subs really are a product of the Silver Age, but I found myself grooving on the sweet charms of the characters. There’s an earnestness you don’t find in today’s comics. It’s been a very long time since I was a young lad reading comics. I do remember enjoying stories that featured heroes with just one special ability that was seldom useful. What I recall is that these heroes, when they worked together, could be just as effective as the big boys. That’s true, Brian. 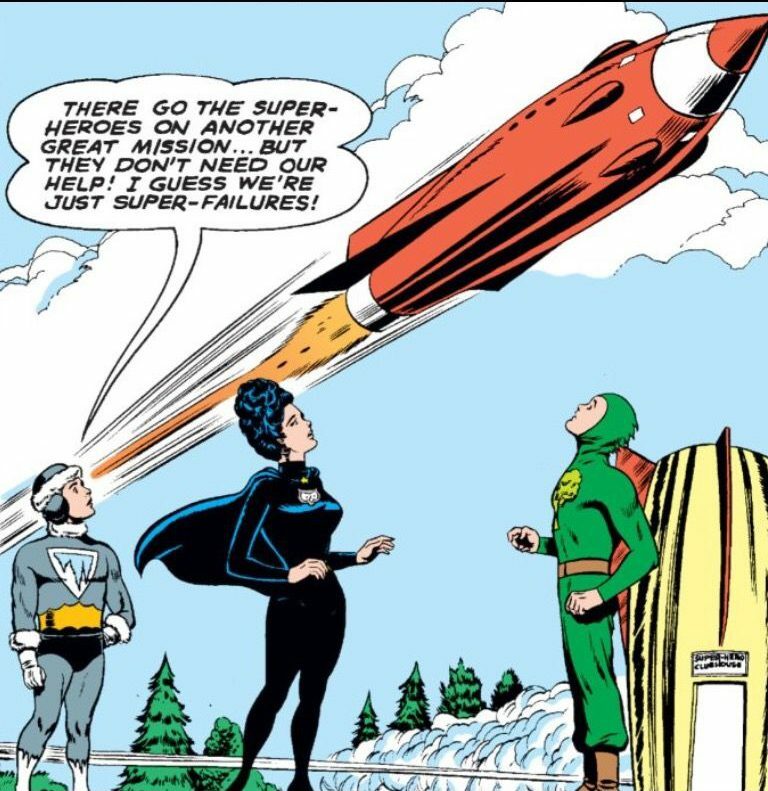 DC’s Silver Age was always big on emphasizing teamwork. I liked the reference to Matter-eater lad, one of the most quirky, but ultimately useless heroes! Hah, yeah, I have no idea what the writers were thinking with Matter-Eater Lad. Any time he was in action, it was just so bizarre.